Since his birthday was going to be other presents and grandparents, I wanted him to enjoy playing with his Jedi Robe before the craziness. Major backfire. I remember times growing up when I wasn't as appreciative as I should have been to my parents for the time or effort they had put in for me. (thanks, mom and dad...I'm glad you didn't give up on me) So my 2:30am late night gave me an "I don't want to wear that" and a walk out of the room. Wow. That was my 1st time on this end...and unfortunately, probably not my last. That's part of what kids have to figure out: real gratitude. I think we all still work on it even now. Anyway, he has yet to try it on. I put it away until grandma comes, she's bringing the coolest part of the costume, the light saber. 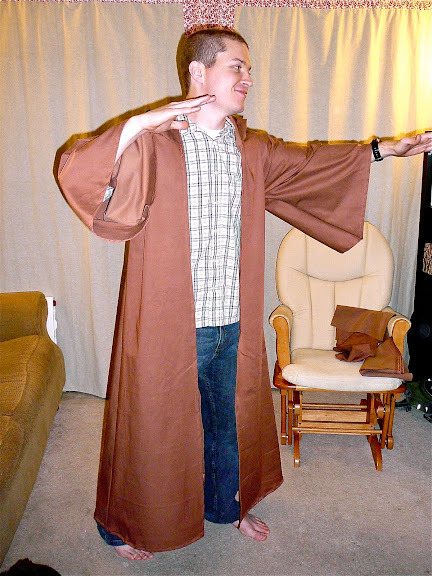 Also, I've rectified the situation by making my Obi Wan husband a matching robe. (shh...i got him a light saber, too. surprise.) If Dad is wearing it, then son will wear it. I'm just waiting for the times when Dad has to go strutting around the apartment complex with his light saber and robe on. Good pictures to come. Since my little buddy hasn't put his on yet, I have no pictures of him. However, here's one to wet your appetite of my man. P.S. After I had made my son's, I went back to look at V and Co. blog and found this link to the pattern she used. This is how I made my husband's and it took 1 hour start to finish and was soooo easy. (I used 4 yards of fabric - he's 6' tall).